Congratulations, nice overhaul! Where did you get that bearded fellow - he is not you in disguise, is he? I rather like his blue shirt, it reminds me of those shirts the "FDJ", the state youth organization in East Germany, used to wear. His beard, however, looks very "kirchliche Opposition". How did you find this link before it went 'live'?!! Whatever else can be said, I reckon he looks as Kansas City Fundie scary as it gets. Ok, I think the new site looks great, I like the name, and I especially like the header and pics in the header and the header description. btw, if God Almighty hates book "lerners" does that mean he hates those who learn from the book called "The Bible?" If He does, I'm in big trouble. That pic goes in all kinds of directions, doesn't it? Hi TB, I think that's one of the amusing features of this photo! 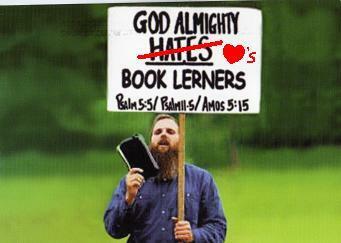 Fancy standing there with a sign saying God hates book learners, while waving around a book they read daily! Jim, I've added a small Tübingen motif in honour of your 'Tübinger' suggestion: My Tübingen car number plate, umlaut and all. 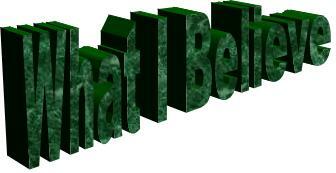 Like Simon, I also cheated and found your new site before it had been launched (thanks to the ever-watchful Technocrati). Ahhhh! That's how he did it!